Most people think of beaches and Hollywood when they think of Los Angeles (LA), but the city is surrounded by mountains that often get covered in snow through the winter months. So it's not really surprising that there is also a thriving winter skiing, snowboarding, and snowshoeing culture with multiple ski resorts within an easy driving distance of Los Angeles. With the closest ski runs under an hour and a half from the coast, once winter comes, you can hone your moves on a surfboard or kiteboard at the beach and then snowboard in the mountains, all on the same day. If you're looking for a destination for a week-long ski or snowboarding vacation, I'd go farther afield to bigger locations with more trails and reliable snow, like Mammoth, Lake Tahoe, or Alta, Utah, but if you just want to stay in good ski condition or try out skiing or snowboarding for a day to see if you like it, there are a number of ski areas near Los Angeles that will do the trick. Winter sports areas range from highly developed resorts with many lifts, groomed runs, snowmaking machines, nightlife, and plenty of lodging to simple ski areas with minimal amenities and undeveloped backcountry ski areas. In addition to alpine downhill skiing, which has always been popular in the Southern California mountains, snowboarding has its early roots there, and Nordic cross-country skiing and snowshoeing are increasing in popularity. In recent years, more dedicated tubing and other snow play areas have also been developed for more family-fun options. There is a Ski California Gold Pass, which allows you or anyone with your pass to ski or ride at 32 downhill and cross-country resorts. 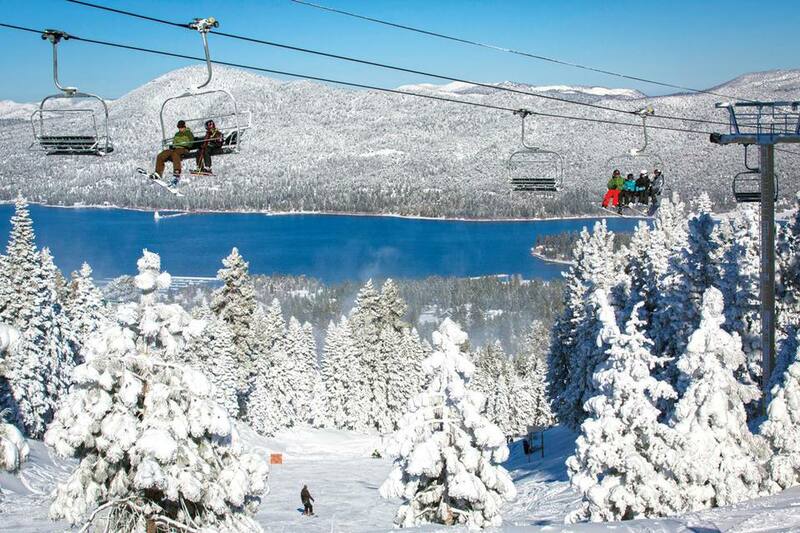 Big Bear Lake in the San Bernardino Mountains is the most popular ski and snowboarding destination near Los Angeles. It is not the closest ski area, but with two ski resorts, abundant dining, plenty of locally owned accommodations, and lots of other things to do on the mountain, it has the most to offer, especially for families. Some attractions that are often located within a ski resort are separate at Big Bear, like snowshoeing, snow tubing and zip lining, which can be found nearby but are independently owned and operated. The two ski and snowboarding resorts at Big Bear are Snow Summit and Big Bear Mountain, both part of Bear Mountain Resorts. With the pass available through Mammoth, you can get unrestricted access to all four California mountain resorts including Mammoth, June Mountain, Snow Summit, and Bear Mountain. Snow Summit is the closest ski resort to Big Bear Lake Village and just 104 miles (or a little over two hours) from Los Angeles. It is more popular with skiers than snowboarders, with more long runs and fewer terrain features than its nearby neighbor, Bear Mountain, and its Family Park on the west side of the resort is popular with beginners and kids—most beginning skiers find the slopes here better than the beginner area at Bear Mountain, which is flatter. With snow-making on 100 percent of the 24 ski runs, Snow Summit has more open days than the ski areas without snow-making facilities. Snow Summit gets more crowded than Bear Mountain, but with an uphill capacity of 18,550 per hour, even when it's crowded, people are moving. One of the other fun features of Snow Summit is nighttime skiing on weekends and holidays. The rental shop and ticket office open at 7:30 in the morning on open weekends so you can be ready for the first lift runs allowing for maximum time on the mountain. Lift tickets for Snow Summit are also good for Bear Mountain, and there's a free shuttle between the two, and there is a significant discount on lift tickets ordered online at least 48 hours in advance. There are multiple eating and drinking establishments at Snow Summit including two mountaintop restaurants with amazing views, but there are not a lot of the kind of huge rental condos you'll find at Mammoth or Lake Tahoe, but lots of small hotels, lodges, and vacation rentals if you're inclined to stay. Snow Summit also offers free lift tickets on your birthday and "Ski, Stay and Save Packages" year-round. The second resort at Big Bear Lake is Bear Mountain, and both Snow Summit and Bear Mountain are owned by Bear Mountain Resorts so one lift pass gives you access to both resorts via a free shuttle to transport you the 10 minutes between the two, or you can get an annual pass with access to all four Mammoth-owned resorts. Bear Mountain is the most popular destination for snowboarders due to its multiple and ever-expanding terrain parks. Since snowboarding skews young, you'll find young adults and teens dominate "the Scene"—the name that was given to the multiple bars, snack bars, restaurants, and shops at the Bear Mountain base area. There are no mountaintop restaurants at Bear Mountain, so if you're looking for lunch on the mountain, you'll have to go over to Snow Summit. And, there are no skiing nights, so some people head over to Snow Summit for a few night runs after a day on Bear Mountain. Bear Mountain does have the longest single run at Big Bear, which is the one and a half-mile Geronimo Trail, and like Snow Summit, Bear Mountain offers free lift tickets on your birthday and "Ski, Stay and Save Packages" year-round; so you can do a quick search for Big Bear Vacation Rentals or Big Bear Hotels to find the best prices around for your accommodations before you travel. Mountain High Resort, near Wrightwood, is on the north side of the San Gabriel Mountains. At just 86 miles away, it is the closest full-service ski and snowboarding resort to Los Angeles with access to on-site dining, equipment rental, and nearby lodging. One of the things locals like about it is that you can drive around the mountain to get there and avoid a lot of driving delays. Mountain High is actually three different resorts a mile apart from one another that go by the inspired names of West Resort, East Resort, and North Resort. The lift pass is good for all three and there's a free shuttle between them. If there hasn't been a lot of snow, some of the trails may not be open, since they only have snow-making ability on 80 percent of the runs. In fact, they may have as few as 10 of 59 trails open, especially at the beginning of the season before the snow builds up, so check the trail status before heading to the mountain. If you've already skied some of the best resorts in the world, you may be disappointed in the scale and some of the outdated amenities like the older lifts. However, if there has been good snow and the full facility is open, there are some good technical runs for advanced skiers. Mountain High can also be a great beginner resort, especially if you don't fit the average skier demographic as they have special programs for seniors, women over 30, and an adaptive program for learners with various disabilities as well as winter weekend ski day-camps for children and teens. The West Resort is the biggest of the three with 34 trails and eight lifts. It has the most technical trails and unique terrain features for progressive riders and skiers of all skill levels, with 17 advanced trails and Vertigo, an expert-only trail. Most of the on-hill contests, promotions, and live performances happen at West Resort, making it popular with the teen crowd. It is also Southern California's only local resort open for night skiing five nights a week during peak season. Peaking at 8,200 feet, the East Resort has the longest trails and some of the best views, looking out over the Mojave Desert. The longest trails are the intermediate Goldrush and the expert Goldrush to Sundance, both about one and a half miles. There are additionally 16 trails to explore or you can enjoy the scenery from the Grand View Bistro at the top of the Mountain High Express quad chairlift. North Resort, directly across Angeles Crest Highway (Highway 2) from the West Resort, is a remake of the former Ski Sunrise at Table Mountain. North is the smallest of the three ski areas, with 10 trails and only one lift, and is kind of an upside-down resort: the parking and amenities are toward the top of the mountain, so you ski down, and take the lift back up to the resort. North Resort offers 70 acres of easy terrain, great for families and beginning skiers, as well as the North Pole Tubing Park, the largest groomed tubing area in Southern California. However, North Resort is only open Friday through Sunday in peak season. Most locals ski Mountain High as a day trip, but there are a motel and rental cabins in Wrightwood and additional hotels in Phelan, about 20 minutes away. Mountain High is 30 miles farther than Mt. Baldy or Mt. Waterman, but takes only a few minutes longer to get there from LA, since there's not a lot of mountain driving. Mountain High is at the intersection of CA Highway 2 and CA Highway 138. If you're just driving up for the scenery and enjoy winding mountain roads, you could take the Angeles Crest Highway (2) all the way over the mountain—assuming it's not closed by snow—but it's not the fastest way to get there. There are multiple freeway routes around the west end of the mountains via the 405 N to 14 E and local roads to 138 E, or around the mountains to the east via the 210 (or 10, or 60) E to 15 N to 138 W.
Snow Valley Mountain Resort is located just outside of Running Springs, about halfway between Lake Arrowhead and Big Bear Lake on Highway 18. Its lower elevation—about 1,000 feet lower than Bear Mountain—means that Snow Valley usually doesn't get snow as soon as the resorts at Big Bear. Since they only have the ability to make snow on half the trails, they may have just a few of their 28 trails running if there hasn't been a lot of snow. Still, just 91 miles from Los Angeles, Snow Valley has a nice combination of technical trails and beginner terrain that makes it popular for families and groups with diverse skill levels. It's known for being more economical, more friendly, and less crowded than the Big Bear resorts. One reason it's less crowded is the lack of adjacent lodging as you'll likely have to drive the rest of the way to Big Bear, Lake Arrowhead, or down to San Bernardino to find a place to sleep after your tiring day on the slopes. The other reason is that since there is no place to stay, there are fewer non-ski recreation activities available. Those shortcomings are a blessing if you're looking for a less crowded, reasonably priced resort within two hours of LA. In addition to 28 trails for skiing and snowboarding, there is a dedicated Snow Play Area for sledding (sleds provided), and they offer nighttime skiing on Friday and Saturday nights in peak season. There's a special afternoon-evening lift ticket aimed at teens coming up after school on Fridays as well as a Friday after-school program for kids in First through Eighth grades. Refreshments are available at the base area Sun Deck, otherwise, there are additional restaurants in Running Springs, which is relatively close to Snow Valley. Mount Baldy Ski Lifts in the Angeles National Forest in the San Gabriel Mountains is the second-closest ski area to Los Angeles next to Mount Waterman. Mt. Baldy is a nickname for Mt. San Antonio, but it's so ingrained, that it's the name of the nearest village as well. The ski area is about an hour and 15 minutes from Downtown Los Angeles and plus or minus an hour and a half from Los Angeles beaches—without traffic, making it the closest skiing to a beach. If you want to do the surf-to-ski challenge, the closest beaches are Seal Beach and Newport Beach in Orange County at 60 miles (1 hour, 22 minutes drive time) while Santa Monica Beach to Mt. Waterman is only one and a half miles or five minutes farther. Mt. Baldy Ski Lifts offers downhill skiing and snowboarding on 400 acres, much of it backcountry, accessed via four outdated lifts. Locals consider this area to be one of the best skiing areas around for residents of the region, and 13 of the 26 runs are Advanced or Expert. While it may not the best place for beginners, Mt. Baldy Ski Area does offer beginner lessons. At Mt. Baldy Ski Area, there's a ticket booth right by the parking lot where you can buy your lift tickets, then take Chair 1, also known as the Sugar Pine Chair Lift, on a 15-minute ride up to the Notch—the halfway point between two peaks. There you'll find rental equipment, ski school, ski patrol, restrooms and the Top of the Notch restaurant as well as a disc golf course for off-season fun. If you're just going up to the Notch, you can buy a one-lift ticket, but all the trails from the Notchback down to the parking are double black diamond runs—to get to the beginner and intermediate trails higher up the mountain, you'll need an All-Lifts ticket. Some people find the "vintage" Sugar Pine Chair Lift up to the Notch delightful—in the summer. In the winter, many find the 15-minute ride a little cold and unsettling. The view from the Notch is great, but the food at the Top of the Notch restaurant gets mediocre reviews, and some say the bar food is better than in the restaurant. If you're an advanced skier who can go mid-week after a good snow and are expert enough to ski your way back to the parking lot, you'll definitely enjoy Mt. Baldy, where skiers dominate the slopes but advanced snowboarders can have a lot of fun, too. Skiing and snowboarding lessons are available, and equipment rental includes the basics. Aside from the skiing and snowboarding, though, Mt. Baldy is a popular mountain climbing and snowshoeing destination on every local peak bagger's bucket list, but with just a handful of guest beds in Mt. Baldy Village, most visitors go up just for the day. Mount Waterman, in the San Gabriel Mountains, is a lesser known day ski and snowboarding area near Los Angeles, and the skiers who love it hope it stays that way. It is actually the closest skiing to LA at just 47 miles from City Hall and was one of the first local areas used for skiing, with the first rope tow installed in 1939. Mt. Waterman depends entirely on natural snow, so there have been years where there was not enough snow to open for the entire season. Mt Waterman has three chairlifts serving 24 runs, most of which are advanced or expert level, and is another upside-down resort, with the amenities at the top of Chair 1. Like Mount Baldy, non-advanced skiers will have to ride Chair 1 back down to the parking lot, since all the bottom ski runs are expert level. It's a bit of a trek to get from the top of Chair 1 to the bottom of Chair 2 to get farther up the hill to the beginner and intermediate slopes, and even farther to the bottom of Chair 3. During the season, Mt. Waterman Ski Area is open on weekends, holidays, and Powder Days, and locals await those Powder Days with great anticipation. When the base is deep enough to cover the rocks and there's a fresh layer of powder, skiing Mt. Waterman is great. If you're planning on skiing Mt. Waterman, you should have your own gear or rent it before you drive up as there is no rental available. If the lifts are running, there are restrooms, phones, ski patrol, food, and drinks available at the Warming Hut at the top of Chair 1. Cross-country skiing, also known as Nordic skiing is growing in popularity, and resources are being developed to meet the demand. Rim Nordic Ski Area, located in the San Bernardino Mountains just across the street from Snow Valley on Highway 18, is the first and only cross-country ski area in Southern California with machine-groomed trails for Nordic skiing, skating, and snowshoeing. They offer lessons and rentals for traditional cross-country skiing, ski-skating, and snowshoeing, and in the off-season, the resort is used for mountain bike racing and trail running events. There is no restaurant on site, but there is a small shop that sells snacks, souvenirs, and cold-weather gear you might have forgotten as well as a snack bar across the street at Snow Valley or restaurants in Running Springs. There are a few guest beds in Running Springs, too, but otherwise, the nearest lodging is about 20 minutes away at the west side of Big Bear Lake. It's easy to get confused about Mt. Pinos, the highest point in the San Emigdio Mountains in the Los Padres National Forest in Ventura County. The county line with Kern County cuts across the top of the mountain, so some think it's also the highest mountain in that county, a few feet higher than the other mountain that holds that title, Sawmill Mountain. Mt. Pinos is a completely BYO-DIY ski and snow-sport area, with cross-country skiing and snowshoeing being the dominant activity. There are some slopes, but no lifts, so it's not a great spot for downhill skiing. There are no lessons, no equipment rentals, and no amenities beyond porta-potties because the Mt. Pinos Ski Area is a collaborative effort between the National Forest Service and the all-volunteer Mt. Pinos Nordic Patrol that operates a base station on weekends in a building right at the parking lot. The reference point to look for is the Chula Vista Campground or Parking Lot at the very end of Mt. Pinos Road. The Chula Vista parking lot is about 21 miles from the Frazier Park exit off I-5 at the top of the Grapevine. Depending on weather and traffic conditions it is about 1.5 hours from Los Angeles. In addition to a trail map of ski and snowshoe trails, you'll need a National Forest Adventure Pass to park your vehicle, both of which you can get at the Nordic Base on weekends, and at other times, you can get them at the ranger station in Frazier Park. You can also get the Adventure Pass at any Big 5 sporting goods store before you head up. You can also stop by the Forest Service—Mt. Pinos Ranger District, Don's Liquor Mart, and Midway Market in Frazier Park to pick up daily, annual, and secondary passes. You can check for current Kern County Road Closures before heading up as clearing the road when it snows is not the highest priority. Check the ski and weather conditions. The websites for the top ski resorts show the current weather conditions on the mountain and on the slopes. Southern California has been known to go through entire seasons without enough natural snow for some resorts to open, and with the yo-yo temperatures they have in winter, the mountain may be slushy, even right after a big snow. Check which lifts and runs are open. You may have heard great things about a particular resort or ski area, but if you get up there and find out that one out of 12 chairlifts is running or 10 of 59 ski runs, the lines are likely to be long and you may not have access to the runs your friends thought were so great. Driving: For all ski areas, tire chains may be required for snowy conditions and some roads may be closed due to snow or construction work. Check the Caltrans website for current road closures, or dial 511 for current freeway and traffic information. Skip the resort rental line: If you're renting equipment, consider renting it before you leave LA or at rental shops in the nearest town to your ski destination. Rates are likely to be much lower and lines shorter than at the resort itself, so call ahead to check rates and reserve equipment. Be Considerate: Everyone is on the mountain to have fun, and everyone is dealing with the same lines and conditions. If you're a beginner, take a lesson and stay in beginner areas so you don't endanger more advanced skiers and snowboarders (or yourself), and if you're more advanced than the people in front of you, have a little patience and give them some space to be out of your way. Manage Expectations: If you expect LA ski resorts to be on the grand scale of major ski destinations, you'll be disappointed. There are no 5-star accommodations at LA ski resorts. None. By following the above tips and reviewing what each ski area has to offer, you can be prepared and choose a ski area that will give you a fun day or weekend in the snow. Car-Free to Big Bear or Running Springs: If you don't want to drive the mountain roads, or don't have a car, you can take a Metrolink train from Union Station to San Bernardino, and catch the Big Bear: Off the Mountain Bus that stops at Snow Valley and Rim Nordic in Running Springs en route to Big Bear. The travel will be lengthy but you can rest on the train and bus.